They are so mentioned because of the relief-like trained cross in the center as symbol of the livetree. 'Khach' - cross and 'Qar' are called - stone. 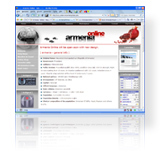 These stone-cutters occur only in Armenia. The Khachqars did not only serve as grave places, it also for honours of all-possible events was set up. In Armenia are some thousands of these steinplatten, but none resembles the other one. Each stone-cutter put his fantasy into the ornamentation decoration, enriched him by plastic items. The size of the flagstones varies between some dozen of centimeters up to some meters. These small memorial places manufacture the best stone-cutters of medieval Armenia.